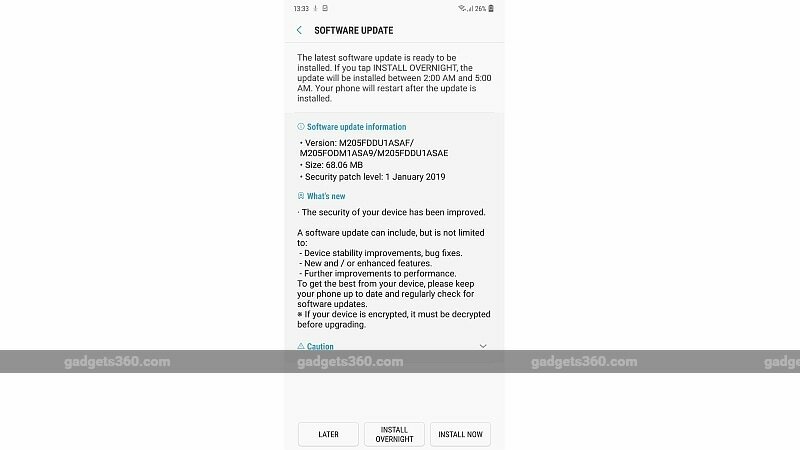 Samsung Galaxy M20 has received second software update just ahead of its formal sale in India. The new development comes less than a week after Samsung brought the first software update to the newly launched Galaxy M20 and Galaxy M10 models. Similar to the last version, the latest software update doesn't bring any major changes to the Galaxy M20. However, the changelog mentions that the update includes some stability improvements and bug fixes as well as performance enhancements. It can be expected that the new software update fixes the slight lags that we noticed on the interface front of the Galaxy M20 at the time of our review. The new update for the Samsung Galaxy M20 is 68.06MB in size and brings software version M20FDDU1ASAF. Notably, the new version doesn't upgrade the existing January 2019 Android security patch. The changelog provided with the update, however, does mention that the update includes device stability improvements, bug fixes, and improvements to the performance. These are similar to what was featured in the changelog of the previous software update that emerged late last month. To recall, the Samsung Galaxy M20 and Galaxy M10 will go on sale in India later today. The Galaxy M20 price in the country starts at Rs. 10,990 for the base variant with 3GB RAM/ 32GB storage, while the 4GB RAM/ 64GB storage model carries a price tag of Rs. 12,990. The Galaxy M10, on the other hand, is priced at Rs. 7,990 for the 2GB RAM/ 16GB storage model, whereas its 3GB RAM/ 32GB storage variant will be available at Rs. 8,990. The dual-SIM (Nano) Samsung Galaxy M20 runs Android 8.1 Oreo based on Samsung Experience 9.5 UX. It features a 6.3-inch full-HD+ (1080x2340 pixels) Infinity-V Display panel. Under the hood, there is an Exynos 7904 SoC, coupled with 3GB and 4GB RAM options. For pictures and videos, the Galaxy M20 has a 13-megapixel primary sensor along with an f/1.9 aperture and a 5-megapixel ultra-wide sensor. There is also an 8-megapixel camera sensor at the front. The Galaxy M20 has 32GB and 64GB onboard storage options that both are expandable via microSD card (up to 512GB). The smartphone also has a fingerprint sensor at the back. Besides, it packs a 5,000mAh battery.